If we’re talking about well-known areas in Bangkok for tourists eager to shop through their holidays, Pratunam is a name that will come up often. Right by the glitzy shopping centres of nearby Ratchaprasong, Pratunam’s claim to fame as a wholesale fashion hotspot comes from the renowned Pratunam wholesale market, a sprawling marketplace devoted to wholesale goods and fashion for all ages. 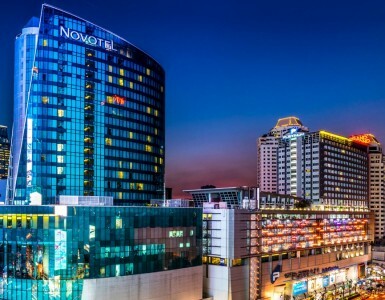 So, serious shoppers and visitors looking for a hotel near Pratunam Market in Bangkok are perfectly served by Novotel Bangkok Platinum Pratunam, with the unparalleled convenience of its location. Located right on top of the Platinum Fashion Mall, Thailand’s largest wholesale fashion retailer, guests staying at Novotel Bangkok Platinum Pratunam are directly connected to the shopping experience, with no need to worry about inclement weather thanks to the escalator leading to the mall from the 6th floor lobby. The hotel itself serves as a welcome oasis from the bustle of the city, with the lobby having an airy feel thanks to the high ceilings and a modern design interpreting platinum and sparkling diamonds in a geometric-inspired way. Also found on the 6th floor are the hotel’s two main dining options, whether its all-day dining and special buffet promotions waiting at The Square restaurant offering the best brunch buffet in Bangkok or The Lounge for a relaxed yet chic space to hold informal meetings and enjoy small bites. The 9th floor reveals a devotion to wellness, with modern gym facilities, infinity pool and spa available along with BAR9 Beer Garden, the hotel’s rooftop hideaway chill-out spot that offers excellent views of the Ratchaprasong skyline. All of the hotel’s 283 rooms are decked out in modern conveniences to ensure a pleasant stay such as free wifi, flat-screen TVs and other amenities. Business travelers worry not, for the business center on the 7th floor is available to aid in any necessary issues. Guests choosing to stay in the Executive floors enjoy the added perks of access to the Lounge with its daily complimentary gourmet breakfast and cocktails & canapes. With all of this and more, it’s clear that whether they are here for business, leisure or a mix of both, Novotel Bangkok Platinum Pratunam is an excellent choice for travelers searching for a hotel near Pratunam Market in Bangkok.